Congratulations to the workers of the Hindustan Times for a great victory in their valiant fight for 14 years against their illegal termination of services. The success of their struggle came on August 27, 2018, when Delhi High Court ordered their reinstatement with continuity of service and on the same terms and conditions as availed by them before termination. 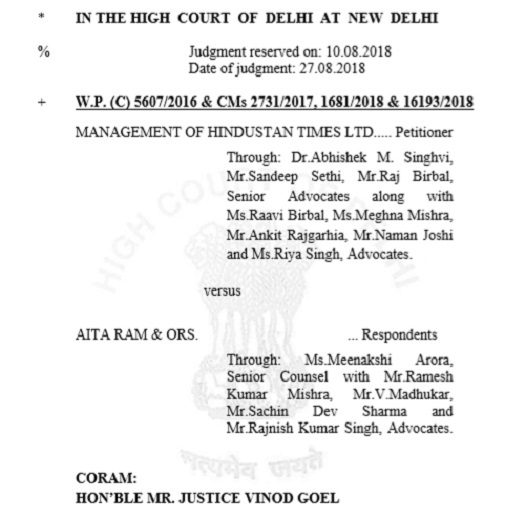 A single-judge Bench of Justice Vinod Goel has dismissed the petition of the management of the Hindustan Times challenging the Award given by the Delhi’s Industrial Tribunal on January 23, 2012 and ordered it to immediately implement the Award of the reinstatement of 272 workers. The Bench also ordered the Hindustan Times to deposit the wages of the workers, who have not yet attained the age of superannuation, for the period from 01.01.2014 till 31.08.2018 within one month with the Executive Court and directing the court to disburse it to each worker individually. The Hindustan Times Limited (HTL) had transferred its 315 workers to the Hindustan Times Media Limited (HTML) on 02.10.2014 with the alibi that its printing undertaking stands transferred and so the workers can seek their dues from the new company. The Industrial Tribunal, however, held that this was a clear case of termination of the workers in the guise of their transfer to a new company. It held it as illegal and unjustified, noting that the HTML was only a subsidiary of HTL and their directors are interchangeable. The company’s claim that all 315 workers had taken the full and final settlement was also rejected as only 43 had done so and as such the Tribunal as well as the High Court upheld the claim of the remaining 272 workers for reinstatement and back wages. Let us celebrate a major victory of the newspaper workers coming just ahead of the elections of Delhi Union of Journalists (DUJ) on September 1, 2018, to strengthen the movement in the newspaper industry. आदेश की कॉपी पढ़ने के लिए नीचे दिए लिंक पर क्लिक करें….